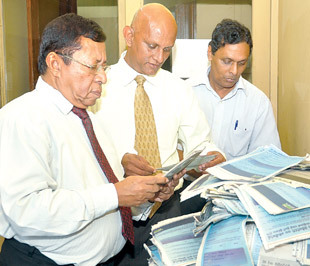 Picking the lucky winners... from left Dudley Jansz (Associate Editor, Sunday Observer), Roy Jayasinghe (Advertising Manager, Sunday Observer) and R.P. Jayatileka (Press Manager) picking the winning coupons among the readers. Pic: Susantha Wijegunasekera. 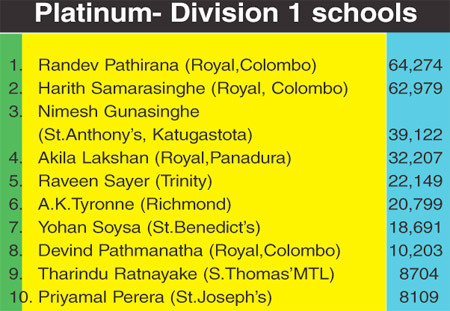 Although Randev Pathirtana maintained his last week lead polling 64,274 votes to his closest rival Harith Samarasinghe ( 62,979) both from Royal College Colombo in the ‘platinum’ segment, there was a change in the ‘silver’ contest for division 111 schools, as last week’s runner up Mohammed Ziraz from Madeena MV, Kandy took the first place with a vote count of 29,147 to Dilshan Kanchana of Devapathiraja, Ratgama 28,899 who was placed second. 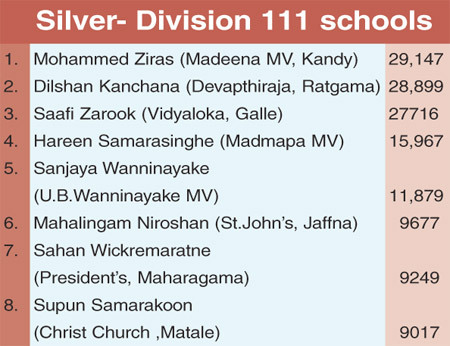 Harith Samarasinghe ( 62,979) both from Royal College Colombo in the ‘platinum’ segment, there was a change in the ‘silver’ contest for division 111 schools, as last week’s runner up Mohammed Ziraz from Madeena MV, Kandy took the first place with a vote count of 29,147 to Dilshan Kanchana of Devapathiraja, Ratgama 28,899 who was placed second. 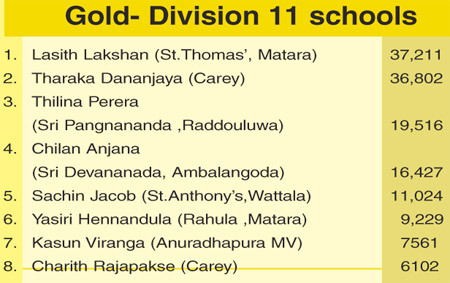 In the ‘gold’ segment Lasith Lakshan of St.Thomas’ ,Matara took the top spot over last week’s winner Tharaka Dananjaya who was placed second.